Before those long, humid dog days of summer pull you down and lock you into your air conditioned living room you may want to start making plans to get away from the main island of Okinawa and plan a long weekend getaway to one of the great outer islands here in the Ryukyu Archipelago. Let me introduce you to a few islands, suggest a few SCUBA getaways, and maybe even help you find a way to get there. This week we are going to start the exploration of these "Islands of Summer" with the near islands in the Kerama Retto. The Kerama Retto consists of six islands grouped near one another and located about 30 km west of Naha. Two of these islands stand out as real jewels for divers, kayakers and campers who want a getaway weekend. You can leave on Friday afternoon, dive all day Saturday and Sunday and then catch the last ferry back to Naha on Sunday afternoon. Both islands have accommodations ranging from western style hotels to the wonderfully quaint minchuku, or tourist hostel. I prefer the minchuku. It saves me money and since I am usually diving all day long why pay more for a room I am not in? On Tokashiki you can contact the DiveInn Kerama dive shop at 987-2571, the Marine Service Tokashiki (hotel) at 987-2426, or the Kerama Marine Dive Shop at 987-2257. 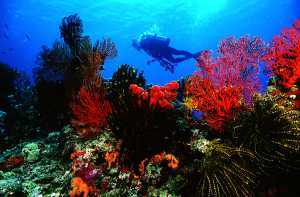 You can expect that each shop will meet you at the port and transport you to dive sites that will amaze you. Expect to pay about 13,000 yen for a day of diving. My favorite dive sites on Tokashiki are found in the coral gardens near the underwater phone cables at Ariga and then just north in the bay between Tokashiki and Gisshippu. You will not be disappointed in these choices but you may, and I would suggest, that you let the dive shop show you their favorite dive sites first. I am sure they have secret places that will thrill you with equal color and excitement. On Zamami you will want to charter your diving with Cat's Inn Dive Shop at 987-2860, the Blue Marine Dive Shop at 987-2331, or the Kerama's Island Sive Shop at 987-2336. All of these shops have great boats and good crews that will scoot you around the fabulous wall diving that I think make Zamami a must log book entry for any diver living or visiting Okinawa. I always prefer diving right under the lighthouse that is directly across from Tokashiki or just behind the lighthouse in the large bay area that stretches the length of Zamami's eastern shore. Under the lighthouse you will find fabulous wall diving elegantly decorated with red and yellow sea fans with squadrons of beautifully colored red Fairy Basslets darting in and out of the coral. Both of these islands offer you great kayaking and pleasurable hiking in the late afternoon as well. Camping is possible on both islands and if you are interested in really roughing it then pack all your gear up in your van and make your way to ferry. Okinawa is really a great place, but there is so much more to Okinawa than just Highway 58. Please do yourself a big favor this summer and get off the beaten paths move and explore an outer island. You will not regret the adventure. If you need help planning your trip to the Keramas, or just want to book a one day get away call FATHOMS DIVE SHOP at 090 8766 0868. 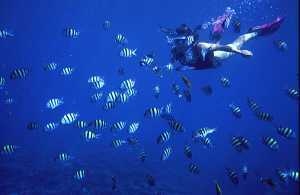 Rich can help you book just about any SCUBA you may want to do. Plan for a great summer. See you on the Ferry!